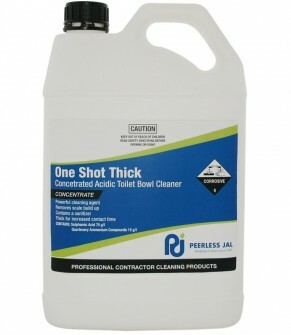 Peerless One Shot Thick is a viscous, buffered acid cleaner, formulated for the maintenance of toilets and urinals, provides thorough sanitising cleaning, deodourising and reoderising in one operation. Use for the removal of calcium scale and deposits, urine stains and encrustations, iron and copper stains (verdigris), and rust stains. Available in 5 and 25 litres. For commercial use only. DO NOT SWALLOW. TOILET BOWLS: Squirt product around the bowl. Scrub with brush. Ensure thorough cleaning under the rim. URINALS: Squirt product onto step and stainless steel, scrub with suitable brush. SHOWERS: Squirt product on surface to be cleaned, scrub with Scotch Brite and rinse well.